Simply love homemade bread. Everybody can do own nice and fluffy bread, just need patience to wait for its proofing time. 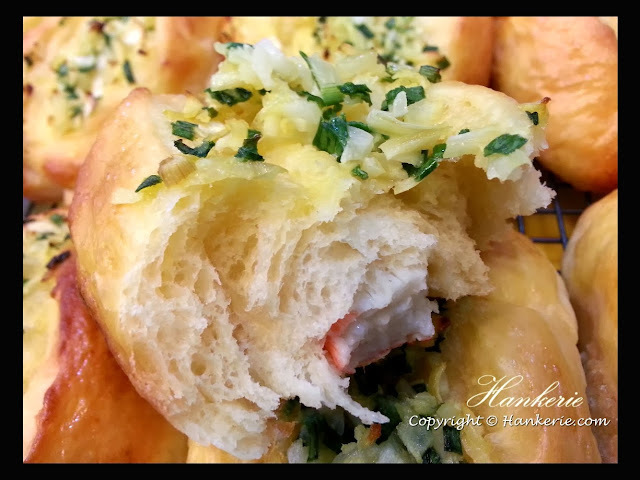 Today I am making fresh spring onions crab stick homemade buns. 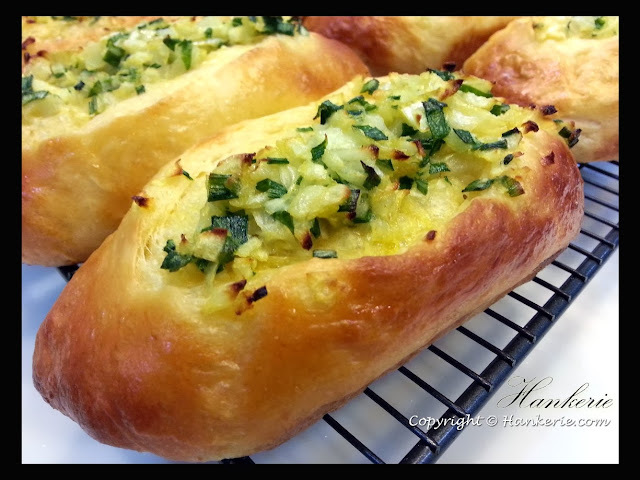 This recipes are improvised from my steamed bun recipes, uniqueness of the onions mixtures - spring onions and onions make the baked bun's taste to the next level. These spring onions are freshly plucked from my organic garden. Once you take a bite, your mouth would be bursting with the onions buttery fragrance, a little bit of sweetness of crab stick in the middle, together with the slightly sweet, soft bun. 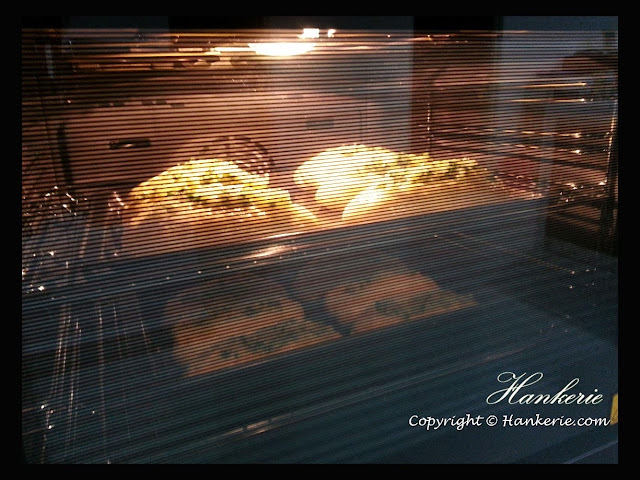 Baking in the process, like when the size doubling in hot oven. In making these fluffy and soft bread, I am using Gelatinized Starch (Yukone method, also known as Water Roux, 汤种) and incorporate into bread dough. This Japanese method is using 1:5 ratio, in other words, 1 cup of flour and 5 cups of water. As for me, sometimes I will still change it accordingly as Malaysia's weather is more humid and naturally our flour is more damp. Pre-prepared tangzhong. Cook until sticky feel. In separate bowl, add yeast, warm water, tangzhong, sugar, and salt. Stir until dissolved. Add the egg, and 2 cups of flour. Mix well. Slowly add the remaining amount of flour until dough is formed. You may or may not use the full amount of flour. It depends on the humidity of your weather. Turn dough out onto floured board. Knead dough for about 6 minutes, adding more flour by the tablespoon, if necessary. Until you see the gluten appear in the dough, add on the butter and knead it. Grease a medium bowl. Put dough into the bowl and then turn dough over so that the top of the dough is also lightly greased. Cover the bowl with a clean kitchen towel and let the dough rise in warm, draft-free place until double in size or about 1 hour. Punch down dough. Turn it out onto a floured table and knead out all the bubbles for about 5 minutes. Roll dough out and shape it long oval shape. Wrap it with the crab stick and seal the dough at the bottom. Preheat oven to 375 degrees F. Grease baking sheets. Set these buns on each baking sheets, cover with clean kitchen towel, and allow to rise in warm, draft-free place until double in size or for about an hour. While waiting for 2nd proof, prepare the spring onions topping. Mix all the ingredients in separate bowl and set aside. Once the bun size is double up. Use the sharp knife to cut one straight line at the middle of the bun. Lightly beat the egg yolks. Brush egg wash on top of buns after they have risen. Input the ready mixed spring onions topping. Bake buns for about 20 minutes or until golden brown. Remove buns from oven and turn out onto cooling rack.